I've also believed that politicians are custodians of the area the they have been elected to serve. That is particularly so on a decades long project to redevelop a town centre and that's what's possibly on offer for Hammersmith. So my fellow Labour councillors and I are setting up a Hammersmith Residents’ Working Party to consider all the issues and work with us and successive administrations on what happens next. Lots of people will want to take part on the Hammersmith Residents' Working Party so there is selection criteria and an application form. If you'd like to apply to take part, please click this link. For the record, I’d love to see the A4 gone and Hammersmith’s link to the river restored. It would be amazing to build a new, environmentally sustainable town centre, fit for the twenty second century, with thousands of new homes for Londoners, a new park and new businesses bringing jobs and opportunity for all our residents. But is that what​'​s on offer with the initial proposals to sink the Hammersmith Flyover and a part of the A4 road? On Thursday 20th June, I turned up at the newly refurbished Lyric Theatre and took part in a panel meeting that was about the “flyunder”. It was chaired by John Humphrys, the ever-excellent journalist and BBC presenter. John Humphrys began by asking the large audience if they were for or against. Only one person raised his hand to oppose. Almost everyone else showed animated approval. But what is actually being envisaged? It’s good to have The Mayor's support but since then not much has happened. Meanwhile, City Hall tell us that they and the Treasury want this scheme to be completely self-financing which will mean high end office and residential developments. And there’s something else too, City Hall say TfL “needs” to demolish and rebuild the Hammersmith Broadway bus and tube station and that scheme must be self-financing as well. 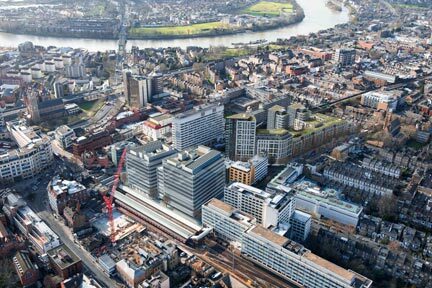 As the audience realised how at its worst, residents could suffer up to twenty years of large scale, high-density development in the centre of Hammersmith, the high enthusiasm from the start of the meeting evolved into a cool-headed pragmatism focussed on what would actually be involved and what would we all end up with? That’s where I am too. Once the Hammersmith Resdents' Working Party has been established, all of us together will consider how and even if we might opt to move forward on any of these schemes.